You are currently browsing the tag archive for the ‘DEER PATH COTTAGE’ tag. More Belties, and my Autumn Urges! On saturday, as we were heading out up to the Smoke to visit Jake and Zara for dinner, we were held up by the arrival of another fourteen belted galloway cows to their winter layback land in the valley. All of a sudden the lower fields were alive with a herd of cattle; Bella and her six sisters came to greet the new arrivals which included a dun cow and a pure white lady. Some of the new arrivals were very young- just off their mothers in fact, and we had been warned that they might be noisy. 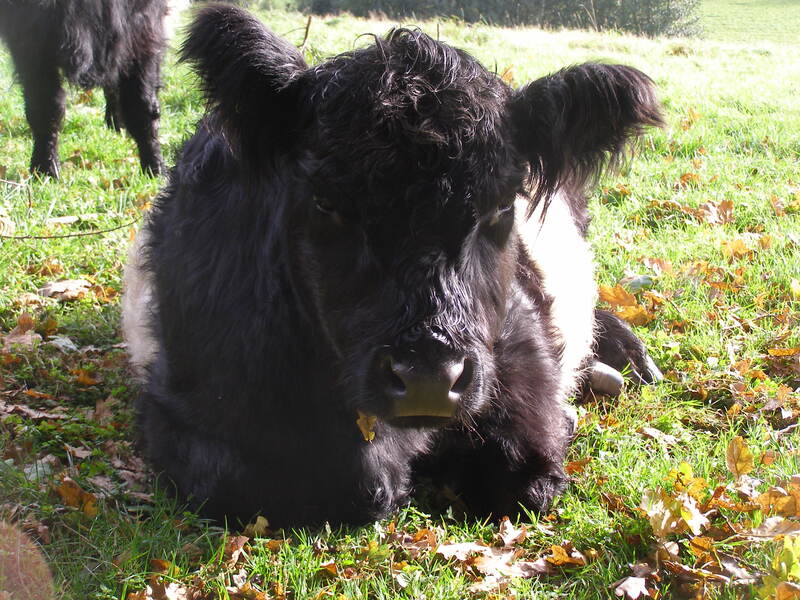 True to form, we had a phone call this morning from Suzy one of our local lookering volunteers who had been surprised to hear mooing outside her house, and on going to inspect what she expected to be seven beasts was confronted with 21 animals emerging from the mists- what a surprise she had! Everyone in the valley seems truly taken by these gentle, beautiful animals; I have seen paintings of the estate when cows were here before and the place looks like its getting back to something like it once was. Saturday morning was turning out to be a busy one. Suzy had also called to let us know that a birch had come down in the night and was lying across the electric fence that the SWT had erected to keep the cows from wandering off site. One of us had to go and deal with this but we had plans already to trek up to Leytonstone to check out a transit van decked out as a camper. But with the landlord on his way with a contractor to measure up the house for a wood burning stove the place needed tidying, and Shep was desperate for a good walk. So I set off with my bowsaw and loppers to do the job on my own while Fi headed off to Gibbet to give our boy some well-deserved exercise. I started off down the ride from Deer Path to the moat, with the rain rat-a-tat-tatting on the hood of my North Face jacket. I passed the plantation full of birch, rowan, oak and cherry, squelching my way along a waterlogged track past the chestnut coppice. In spring time this place is a riot of bluebells, but now there is a different energy. A line of mature beeches-a hedge once undoubtedly-towers over the coppice, dark sinewy limbs and muscular trunks boasting their effortless majesty , reaching out with jade, amber, bronze and caramel pennants to taunt the spindly chestnut lances across the ride. Despite the dim light and dampness, there is something about the Autumn colours and smells that puts my head back on straight and calls me to action. I’ve got the urge to go to work in these woods- the regular lines of young trees in the plantation desperately needs thinning out ; the chestnut coppice is ready to yield at least some of its woody gifts; and here and there over-stood hazel coppice needs the weight taking off its ancient limbs and rejuvenating. And the rhody is rife amongst the woods here, planted around the moat as a decorative plant by the Victorian owners and now the dominant understory shrub beneath coppice and plantation. The landowner was kind enough to let me at his hedges for the benefit of the dormice- a small family of which I found in one of the newly-erected monitoring boxes this autumn; and now we have had talks about woodland management too. I hope it won’t be long before a plan is on the table to get the woods back on the road to health for the benefit of all ist inhabitants. I find the birch and make quick work of some of the smaller limbs that have pinched the electric fence to the ground. With a bit of shuffling I managed to slide the main bole off from the barbed wire perimeter fence too. But I shall be back with chain saw to finish the job. I look up from my work and smile a at the cows out in fields, sodden but happy. It’s just right. I make my way back to Deer Path Cottage, my head full of woody dreams. 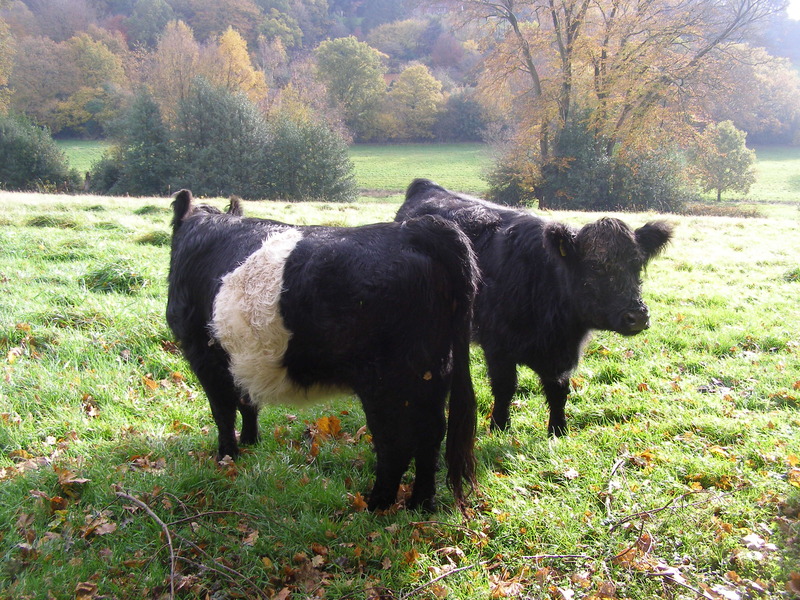 This weekend seven beautiful belted galloways turned up in the fields around Deer Path Cottage. to spend the winter, with 13 more on the way. The seven just arrived are Fi’s girls that have been doing a fantastic job grazing out on the heath she managages for Surrey Wildlife Trust. But it was time to take them off and happily an arrangement has been struck with the landowner here, and much needed grazing returns to the valley. The fields the girls were to use were fenced round with an electric fence earlier in the week and happy to say the SWT Grazing Team even circled round the hedge we (The PTES Hedgerows for Dormice volunteers (www.ptes.org/hedgerows)) managed last year. Fi, Shep and I went out to check the girls this morning and they were happily laid up in one of the higher field near “The Ancestors Path”. There are two red-brown and five black cows, all with varying patterns of ‘belt’ which has given them a sense of individuality so that Fi and her volunteers gave them all names- Bella, Erica, Betty, Doris, Agnes, Molly and Bertha. We’ll be keeping an eye on them -“Lookering”- for the rest of the winter.